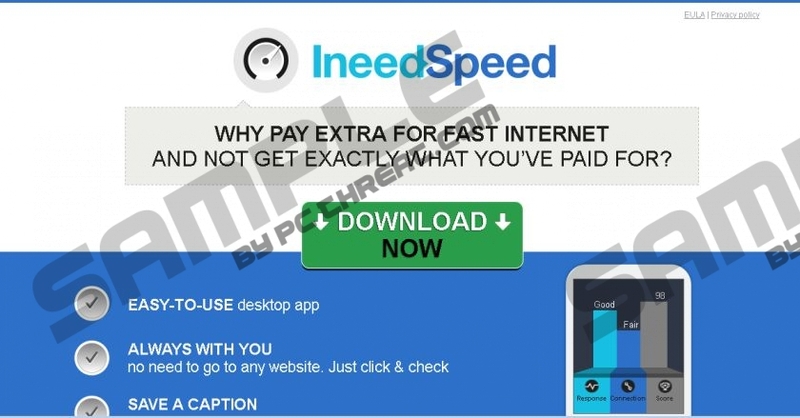 Ads By Ineedspeed is a one more adware application that has been circulating on the web lately. Quite a few users might be tempted to install it due to the misleading marketing slogans. Ads By Ineedspeed is advertised as an application that will test your broadband quality. It sounds useful if you want to find out exactly how fast is your connection. Unfortunately, the results provided by Ads By Ineedspeed could be quite questionable. What is more alarming is that this adware application could expose your operating system to other internet-based infections. In reality, Ads By Ineedspeed is an utterly worthless application that could cause a lot of virtual security problems if it is not removed immediately. The removal of Ads By Ineedspeed is essential, if clean and secure operating system is your priority. As soon as Ads By Ineedspeed gains access into your operating system your browser will start displaying numerous third-party commercial adverts and annoying pop-ups. Browsing the web will be a frustrating task; and ironically, the application that should measure the accurate speed of your internet connection will actually slow it down and will make it more difficult to use. Browsers such as Mozilla Firefox, Internet Explorer and Google Chrome are affected by this adware; thus, no users can feel entirely safe. It was revealed that Ads By Ineedspeed is very similar to dubious applications such as Remarkit, Passwidget, and VeriBrowse. Thus, it is not surprising that Ads By Ineedspeed just like some of its counterparts could exhibit some potentially harmful features. Since all the adverts are provided by suspicious adware serves, it is quite likely that you could be exposed to some detrimental web content. It is possible that some adverts provided by Ads By Ineedspeed could contain redirect links. Therefore, landing on a website filled with malware executable files is extremely likely. You could also be redirected to a fake online shop that was crafted by cyber crooks in order to steal your sensitive data. It is quite obvious that keeping Ads By Ineedspeed on your system is a very bad idea and a risk that you should not take. Remove Ads By Ineedspeed once it is found present on your operating system without any hesitation. A complete removal of Ads By Ineedspeed will stop the annoying and potentially malicious activities. The removal guide that is provided below is easy to use and virtually any user should be able to delete Ads By Ineedspeed without encountering any problems. Once you are finished conducting the manual removal, we recommend analyzing your system for potential leftovers in order to make sure that Ads By Ineedspeed was removed completely. Now right-click on the background and select All apps. Now locate and select Control Panel. Now select Ineedspeed and click Uninstall. Now type Control Panel into the text box. Confirm that you want to remove Ineedspeed. Then select Add or Remove Programs. Now select Ineedspeed and click Remove. Quick & tested solution for Ads By Ineedspeed removal.